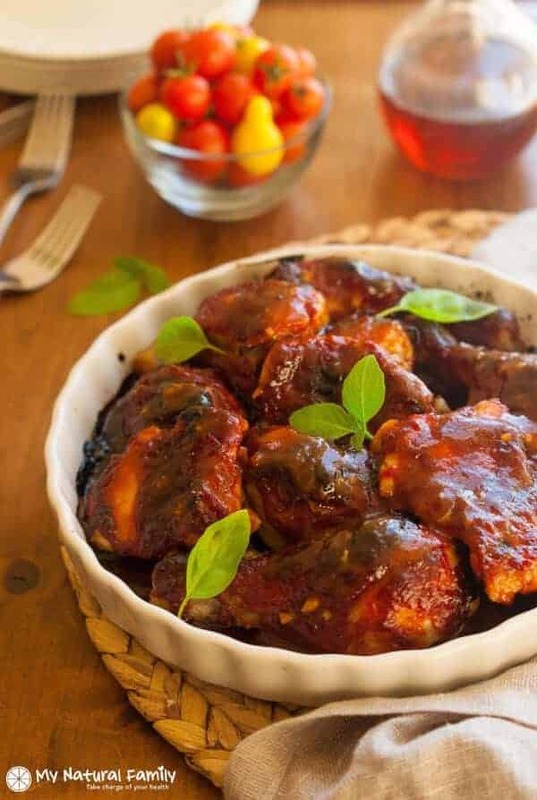 This is a really quick and easy sweet & sticky BBQ chicken thighs in oven recipe. 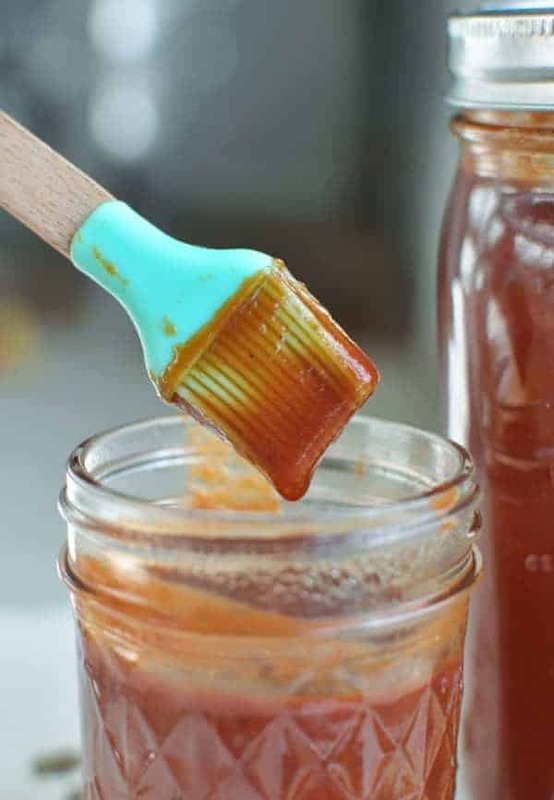 It’s much healthier than using a bottle of store bought BBQ sauce. The chicken recipe I have for you today is a Sweet & Sticky baked chicken thighs. I hope that you enjoy my new recipe. My all-time, go-to easy chicken dinner used to be something my kids called “sticky chicken”. I used to just take a bottle of bbq sauce and that cheap maple syrup (that’s probably just made of high fructose corn syrup), mix them together, pour over the chicken and bake. It’s really good but is probably made of little more than high fructose corn syrup, so…not too great for you. This BBQ chicken thighs in oven recipe is so good, my kids beg for it all the time. It’s really quick and easy to make so it’s a win-win. Basically, all I do is put the chicken in a pan and while the oven is preheating, throw all the ingredients in the saucepan and let them get started warming up. By the time I get all the ingredients in the pan, I call it good enough and dump it over the chicken and throw it in the oven. I love that I can do anything I want while dinner is cooking. And while the oven is already on, I usually add some things to the oven to finish off the meal, like a baked potato and roasted vegetables. I thought that if you were looking for quick baked BBQ Chicken Thighs recipes, this would be a good one to do. So I made it completely healthy with a very quick made-from-scratch bbq sauce and real maple syrup. It’s still super-easy and really just involves taking 5 minutes to make the sauce, pour over the chicken and bake. You will love how the sauce thickens up and gets sticky with a nice, roasted flavor and the chicken gets tender from all the time in the oven. I love meals like this because I can throw it all in the oven and then do something while dinner is cooking, like clean, help with homework, do the laundry, make breakfast and/or dinner for the next day. You get the idea. Heck, if you’re one of those lucky people with a shorter to-do list than mine, you could relax while dinner cooks. I haven’t tried this in the slow cooker, but I bet it would be SO good. The tomato paste can be subbed with tomato sauce if you want a sauce that’s not quite as strong and quite a bit runnier. Make sure you use real maple syrup. Not the flavored sugar that some companies like to call maple syrup. The deeper the color and lower the grade, the better. You can also use this same recipe on a grill. Cook the sauce longer in the saucepan until it gets thick and rich. Then just baste the chicken every few minutes when you turn the chicken and serve the remaining sauce with the chicken. Make sure and use a separate sauce for basting than you use for the top to avoid cross-contamination. I especially love it this way when there is skin on the chicken. Someone always asks this, so I’ll just address it now – Yes. You can use chicken breast. It may turn out a bit dry, and they take less time to cook. I can’t tell you exactly how much less cause it totally depends on how thick they are, etc. but maybe 10-20 minutes less. Make sure not to overcook the chicken breasts, because that’s very easy to do. I think this meal goes particularly well with my Paleo mac and cheese recipe. I hope you like my Baked BBQ Chicken Thighs recipe. Let me know what you think; I’m interested to know if other people like it as much as I do. Let me know if you try these both together and what you think by commenting below! This is a BBQ chicken thighs in oven recipe. It is chicken with a sweet and sticky BBQ sauce on top. Could I use lemon juice instead of pineapple? I cant eat pineapple. Sounds Delicious !! !….Is Delicious Thanks !!!! I’m so glad you like the recipe. I sure like how easy it is to throw everything in the pan and walk away until it’s done. I see you suggest using bone-in chicken legs OR boneless thighs. Why is this? Would bone-in thighs work? Boneless breasts? I want to make this but using a variety of chicken pieces. Would anything change regarding time and temperature using boneless vs. bone-in? I know usually bone-in cooks longer. Thanks! Correct. Bone-in takes a little longer. Chicken breasts also cook faster and can dry out quickly when overcooked so I don’t like cooking them with chicken thighs. Although, if you are like my husband and like dry meat, then it could work out perfect for you. Plus, the sauce will help make the chicken breasts not dry. I had to read the comments to see what to do with the tomato paste, it doesn’t seem to be updated in the recipe? Could I substitute the maple syrup for honey? Sure if you think you would like that flavor more. So I just made this, and it’s delicious but the sauce got watery when I baked it. I covered the dish with tin foil, should I have cooked it uncovered? Yum, I’m definitely going to try this one. It looks delicious and with thighs I bet it’ll stay tender & moist. It will give the dish a little bit of flavor, I haven’t tried it but it might work out well. I don’t see why you couldn’t. Go ahead and give it a try if you want and let us know how it works for you! We would love to hear! I’ve never seen a recipe for a BBQ paleo! How neat! Thanks so much for taking the time to link up with us over at the #HomeMattersParty – we hope to see you again this Friday! Feel free to bring a friend! You are welcome! If you give this recipe a try, let us know what you think of it! Yummy! I want to make this recipe! This looks really good and simple to make. I’m saving your recipe. I think cole slaw and potato salad would be a great sides, but the first thing I thought of was steamed rice. Yeah, I know you don’t think of rice with BBQ, but that’s what popped in my head. lol Thanks for sharing! Has anyone tried lemon juice? I just realized I don’t have any pineapple juice…..
Where can I find pineapple juice concentrate? I am only finding regular pineapple juice. Thanks! I made this last night. It was very tasty, everyone loved it. I’m only upset that I didn’t make more. Thanks a bunch. I love bbq and haven’t eaten it much because of the sugars and artificial ingredients etc, this just save my bbq love ! Good to hear! Thanks for the feedback. Made this tonight and it was delicious. Such great flavour! Will definitely make this again. If I wanted to make this but put it in the crockpot instead with boneless skinless chicken breast, how would I go about doing that? Just throw everything in the crockpot and let it cook? How long and on which setting? Or would you suggest not making this in the crockpot? You would place the chicken in the crock pot, pour the sauce over it, and cook it on high for 4 hours or low for 8 hours, checking for done-ness 1/2 way through, as all crock pots cook at different heats and speeds. I am super exited to make this chicken tonight, but I do have one question. In the ingredients list you have a small jar of tomato paste, but adding that is not in the instructions. I assume I should add it with the juice, cider vinegar, and syrup when making the BBQ sauce?? Also, I don’t have any pineapple juice, so I’m subbing OJ… Hoping that will work ok. What do you think? Thanks!! Just pinned your chocolate cake as well! Saving it for the next family party! Sorry about that I just updated it, you add it with the pineapple juice, maple syrup, and apple cider vinegar. The Oj sounds interesting, I think that could taste good it will change the flavor a lot but I think it would work. Let me know how it turns out! Ok so the OJ made the sauce a little more tangy than sweet, which I expected, but it was still super good. We like a little more kick in our BBQ, so I’ll add a touch of cayenne next time. This will become a staple in our home, I’m sure! Thanks!! great recipe for sauce…just makes you want more. In your directions, you don’t say when to add the tomato paste. I’m guessing it’s along with when you add the pineapple juice, maple syrup, and apple cider vinegar. Is that right? Sorry about that! You’re right, the tomato paste goes in with the other liquid ingredients. Thanks for catching that!